Brent oil prices rose by 2.11% (US$1.21), as prices declined this week. Oil traded on October 25, 2017 at a price of 58.44 (US$/ barrel) and began the year at US$56.90 per barrel. 87 Octane prices increased week over week, by 0.84% (US$0.98 ). Additionally 90 Octane increased by 0.82% or $0.98 week over week. 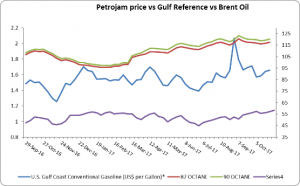 87 Octane and 90 Octane opened the year at J$97.32 and J$98.98 respectively and now trades at J$117.49 and J$120.33 per litre. The difference between lower U.S. domestic crude oil prices and foreign crude oil prices in the past two months is at its largest since 2015. Despite the recently widening spread, flows of domestic oil into U.S. East Coast (Petroleum Administration for Defence District (PADD) 1) refineries are not anticipated to increase unless the discount widens further. Between 2011 and 2013, when domestic crude oil prices were significantly lower compared with foreign crude oil, refineries on the U.S. East Coast changed how they were supplied with crude oil. Over the past two months, the domestic crude oil price discount has increased to the largest it has been since 2015. The current price spread between foreign and domestic crude oil has not grown large enough, and it is not expected to last long enough for changes similar to those seen between 2011 and 2013 which require long-term investments and commitments. Before 2011, refineries on the U.S. East Coast typically processed imported crude oil because transportation options for sourcing domestically produced crude oil were limited and relatively expensive. The Brent-West Texas Intermediate (WTI) spread—the difference between Brent, the international crude oil price benchmark, and WTI, the U.S. crude oil price benchmark—indicates the value of each crude oil and the many crude oils priced relative to each benchmark. For U.S. East Coast refineries, the Brent-WTI spread can partially determine when switching to domestic crude oil would be more profitable.